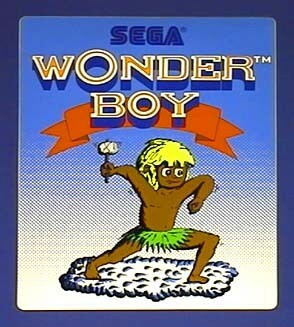 Wonder Boy, a character every Sega Master System fan should be familiar with. As far as characters in Sega's history, however, he's always seemed to have a position a little further back than he should. Though every gamer who plays the SMS is familiar with the name, Wonder Boy doesn't yet seem to really have the third-position (maybe even second!) status he deserves in the Sega hiearchy. Some even misspell his name as Wonderboy, so let's set the record straight from there since this hideous error can be found on some of the most respected video game sites on the internet. It's Wonder Boy not Wonderboy. Regardless of this heresy, it's safe to say that based on his development and great line of titles he's one of the most underappreciated characters in the Sega universe with one of the most confusing histories ever (perhaps a reason for his current obscurity). Few of us know that, besides games on the Master System and Genesis/Megadrive, he has had quite a history of appearances on everything from the MSX to the Nintendo Entertainment System with titles being released before their console counterparts and then when finally released, in entirely different forms. In fact, his history is so confusing at times with odd twists, turns, hacks and varying release dates, that it would put fear into the most diligent of video game researchers. Here's hoping we can bring his status up a few notches in the minds of Master System fans and get all the history straight. Wonder Boy was originally the idea of a company called Escape, who Sega worked with to release the arcade title in 1986. Eventually it was ported to the Master System and a variety of other systems at the time only one year after he first hit the coin-op market. The concept was simple, but original even for its time. The programmers conceived of an islander named Tom-Tom who had to travel around an island, fight various creatures and take on a number of bosses in a huge amount of levels to save his girlfriend Tanya. The story basically runs that Tom-Tom and Tanya are sitting around until the woodland King (just called "King" in the game proper) kidnaps her. Then, since Tom-Tom isn't exactly sure where she is, he begins his adventures of inspecting every inch of the island until he finds her. 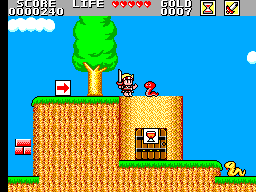 With forty levels in all, tons of enemies, a variety of landscapes and obstacles, hordes of secrets, a hidden level only accessible by carefully collecting special dolls (some hidden) and a unique life meter feature involving the collection of food to keep it from decreasing so the player constantly moves forward, Wonder Boy was a groundbreaking title. After the success of his port onto the Master System, Sega then decided to use Tom-Tom in a different format, one that stuck until he eventually was swept away by some issues we'll get to later. In 1988 Tom-Tom had his name altered as well as the entire world he was previously adventuring in. First he was on an island that seemed reminiscent of early "island films," complete with occasional totems and the like. 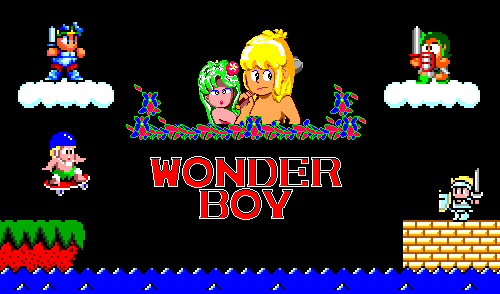 For his second adventure, Wonder Boy in Monster Land, things were different. Starting from the story of the first game, players learn that Tom-Tom is the nickname of Bock Lee Temjin, who lives in a world called Wonder Land. Eleven years after he defeated the evil King a dragon appeared and took over Temjin's world with the help of his "evil, monstrous henchmen." This once serene land turned evil is now called Monster Land, and Bock, by now a teenager, sets out to defeat the monsters and destroy the Meka dragon. Now he was given twelve different locations to travel through as well as new weapons. Gone is the need to collect food, though you are still on a form of timer, and now Wonder Boy can use magic weapons, purchase armor and even cast spells! The game was made closer to an RPG in some respects, for example you need to locate secret keys to access boss levels and continue towards the Meka dragon. Though not necessarily a difficult game, the lack of a continue or password feature made it much harder than its predecessor. The title was an instant hit for Sega, and was ported onto a number of systems such as the Amiga. This was also his first 16-Bit appearance under the title of Super Wonder Boy in Monster Land. From this comes a little understood mystery that some fans, especially those new to the SMS scene, are not aware of. A number of cartridges printed in the early run of Monster Land can be found with the label reading "Super Wonder Boy Super Monster Land." 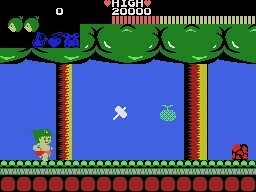 The mistake made by the distributing team was that in Japan Wonder Boy was originally released for the SG-1000, and thus when released for the Mark III in an updated format, though essentially the same game, it was titled Super Wonder Boy to mark the difference between the two, similar in a sense to Castlevania for the NES and Super Castlevania for the SNES, though these are totally diferent titles. Due to this issue, early runs of the cartridge will include super in the title due to a simple mistake on the part of the design team. Eventually it was corrected, but some collectors mistakenly assume this is a rarer variation, which is far from true. 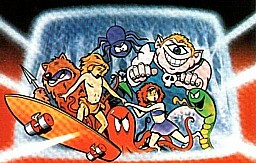 "Super" was held for the series throughout its life in Japan, but would not appear again on the Master System in any form. 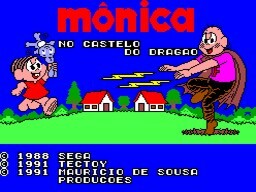 In Brazil, to show a bit of the confusion on his history, the game took on a different form and TecToy decided to scrap the original character and concept, hacking away at it to create M�nica No Castelo Do Drag�o, which featured M�nica, a popular Brazilian comicbook character and her friends. Little of the game was changed except for a few major elements; the most obvious being Wonder Boy and his sword swapped for Monica and her toy bunny, Samson. What made TecToy create a different game is uncertain, though it's likely they thought it more lucrative to utilize a character from Brazilian popular culture instead of the original Wonder Boy. 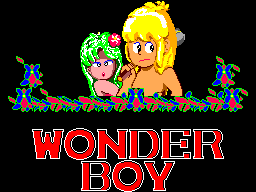 With the success of Monster Land, Sega went further with Wonder Boy and developed his image from the second game. 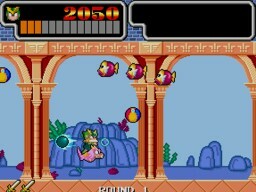 In arcades in 1988 they released Wonder Boy III: Monster Lair, even before Monster Land was ported to the Master System. Lair was later released on the Genesis/MegaDrive and TurboGrafx-16, but bears hardly any resemblance to what is widely considered one of the greatest games ever released for the Master System and easily the best in the series, Wonder Boy III: The Dragon's Trap. Released in 1989 to enthusiastic fans, it further develops the story of Monster Land. Temjin, now just called Wonder Boy, was cursed by the Meka dragon after he defeated him; turned into a Lizard-Man! To save himself he needs to locate the Salamander Cross hidden in Monster Land. Unlike the previous titles, the first being completely linear and the second with some nonlinear elements, Wonder Boy can now investigate any part of the world he wants to as long as he has the proper items to do it. Even more involving is the fact that as Wonder Boy progresses, he is cursed by additional bosses and is given the ability to turn into other creatures. Changing into them at key moments becomes integral to completing the game; Lizard-Man spits fire, Mouse-Man can enter small spaces and climb ceilings and walls, Piranha-Man can swim, Lion-Man can destroy blocks too high for other forms and Hawk-Man can fly. In addition, changing into different creatures alters your attacking power, defense points and charm points (which enable you to purchase different items). 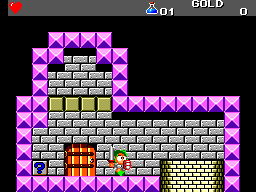 In his third appearance, Wonder Boy also was given the option of using different weapons as well as investigating new features, such as the hospitals, which you can use to replenish your life. Other aspects from Monster Land remain, but Dragon's Trap largely blows its predecessor out of the water with a huge amount of new features and innovation. It was released on the Master System as well as the Game Gear, then later on the TurboGrafx-16 as Dragon's Curse. In Japan it carried the title Monster World II, and for Brazilians it was altered to fit the world of M�nica again, as they did with the second title. 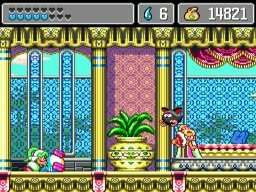 The title of Wonder Boy III: The Dragon's Trap was then changed to Turma da M�nica em O Resgate, which translates into English as Monica's Gang in: The Rescue. Again, however, TecToy merely played on Brazilian popular culture, as little from the game was changed other than the characters, so many fans shy away from this version and the one before it. 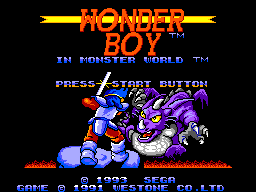 His popularity then solidified and with a solid series under his belt, Wonder Boy was taken a step further with the release of Wonder Boy in Monster World in 1993 for the Master System and in 1994 for the Genesis/Megadrive. The game was later ported and altered to consoles such as the PC Engine in Japan and as another M�nica game for the Megadrive in Brazil, but neither of these are important for our purposes. 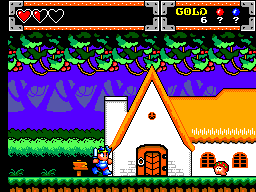 For SMS fans, Wonder Boy returned in what is usually looked at as the second best title in the series. Monster World was unfortunately only released in Europe during this time, and remains not all that common as far as rarity is concerned. In his final Master System appearance, Wonder Boy is called upon by the people of Monster World to save them from the creatures who have plagued their land and to rescue Princess Sheila, who disappeared after she began to search for a hero to save her kingdom. Wonder Boy, now called Shiron, is of course this very hero. The game follows the same format found in Monster Land and in fact appears to have been loosely constructed around it with similar terrain designs and other features. However, it includes the password feature from the third Wonder Boy game as well as throwing in some magical abilities absent from The Dragon's Trap, not to mention some of the most lush and detailed graphics ever programmed for the Master System. However, not many of the abilities are entirely different from what came before it and though an impressive port graphically and musically, it is also somewhat marred by shaky collision detection as well as a basically reused storyline and duplicate gameplay. Wonder Boy again has the ability to collect coins, purchase new weapons, use a variety of items and so forth, but the programmers didn't really offer gamers anything different in terms of the plot or basic game features. It almost feels in certain respects as though one were playing a combination of Monster Land and Dragon's Trap, with updated graphics. Regardless, the game is certainly far from poor due to the even more expansive world to investigate, but to many fans it sometimes holds a place lower than it could have had. Wonder Boy's final appearance, or more properly the final appearance of a game included in the series, only occured for the Megadrive in Japan. As usual, some of the best ports were never released elsewhere, and the final installment, which is techincally part of the Monster World series and involves little to do with Wonder Boy, is called Monster World IV. Since it has hardly anything involving the original series save some connections in storyline, we're not going to go much further, suffice to say that in this title you play a girl named Asha who has to save her desert people from impending disaster. Designed with a middle-eastern feel to it, most fans of the original series may be disappointed to discover this title has little to do with Wonder Boy, good though it may be. If one is to consider it part of the canon, many fans find this title to be the best of all, but we here at Sega8Bit find the issue moot since Monster World IV features almost nothing to do with the original character and thus has nothing to do with his history. In fact, if anything, it has to do with his demise. 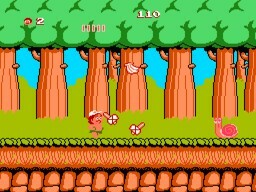 The fact is that in spite of his workability, Wonder Boy has ceased to reappear in the modern world of video games. It's difficult to say what Sega may do with Wonder Boy in the current age where the focus is more on violence. Westone, who was originally the company Escape we mentioned earlier, is now nonexistent and Sega itself has been reduced to making games for other companies since it decided to leave the console scene. Wonder Boy, unfortunately, seems to have slipped to the side in the history of video gaming in the process and few people save those interested in the Master System are even aware of him. This is likely due to the confusing jumble of releases in which he appeared (see links below for a chronological list of titles because I'm sure you're confused), the plethora of systems he appeared on, hacking ala' Korea as Adventure Kid on 4 Pak All Action and changes in themes in video game history. Monster World IV put the character nearly to rest due to a complete lack of inclusion, and may have unfortunately pushed his importance to nothing more than a footnote. Two years ago, however, it should be known that Sega released a version of Wonder Boy for cellphones, but it's doubtful this could potentially lead to a revival. Some fans also theorize that his downfall may have been partially due to the legal confrontation between Sega and Nintendo over the character in the late 80s, simply due to lack of knowledge on the part of retro gamers. When Hudson Soft decided to work with Escape to port Wonder Boy on the NES, Sega, obviously unwilling to allow their major competitor to use one of their most ingenious ideas, refused and Hudson was left to hack the game and create a new title, which bears little distinction from the original. Unfortunately, and this is the key, many NES fans erroneously assume that Hudson's Adventure Island was developed first and Wonder Boy a poor copy. Both series took entirely different directions after the first title was released, but till this day many video game fans are unaware of the impact Sega's creation had and how Nintendo essentially lifted the idea and had nothing to do with the basic game concepts. Thus many people tend to look down upon the series, which is possibly also stemming from the lack of popularity for the Master System in the states, trickling down on Wonder Boy's past and possibly future. Luckily for us, in spite of this, Wonder Boy has a strong fanbase that continues to grow and remain solid throughout the years as more gamers become familiar with the series. Hopefully they now have a resource to wade through his history. It's obvious we Master System fans have nothing new to look forward to, but there may come a time when Sega decides to unearth the character, perhaps in RPG format or something new entirely. This remains to be seen and whether it could even occur is merely speculation.